Call for Tour Group Rates. Call the Hotel to Reserve your room today! Please note comments will not be viewed by the hotel till the day of arrival. We will do our best to accomodate, but special request are subject to availability and can not be guaranteed. Specific room request can not be reserved at time of reservation. Rooms are not assigned until check-in. Patti's Inn and Suites is a non-smoking facility. A $125.00 cleaning fee will be charged to your credit card on file if you smoke in one of our rooms. Non-Refundable Pet Fee $25.00 per stay. ALL ROOMS MUST HAVE A VALID CREDIT CARD ON FILE REGARDLESS IF THEY ARE PAID FOR BY CASH OR GIFT CERTIFICATE. Welcome to Patti's Inn & Suites of Grand Rivers, Kentucky located on Interstate 24, Exit 31. Patti's Inn & Suites is the newest addition to the lake area with 58 rooms. Come stay with us and wake-up to a free breakfast bar of biscuits and gravy, eggs, sausage, cereals, oatmeal, muffins, toast/bagels, yogurt parfaits, fruit and juices. *Breakfast items may vary during our slow season* Patti's 1880's Settlement located just 4 miles from the hotel in downtown Grand Rivers. Relax in our spacious lobby and enjoy 24 hr. complimentary coffee, delicious hot popcorn and use of our computer located in the lobby area. Take a dip in our outdoor pool, open Memorial Day through the end of September. We proudly honor these rates: AARP, AAA, GOV and CORP. We offer free long distance, free movie channels and enjoy wireless service in every room. *2012-2018 Certificate of Excellence Award by TripAdvisor for cleanliness and hospitality. Patti's Inn & Suites is nestled in between Kentucky and Barkley lakes only minutes away from fishing, hiking, golfing, boating, horseback riding and many other outdoor activities. 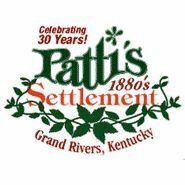 Begin your stay with us with a delicious meal at Patti's 1880's Restaurant and Settlement. Feast on our famous 2" pork chop, flower-pot bread and "mile high" meringue pie. Leisurely stroll through our beautifully landscaped gardens, visit our unique gift shops or play a round of miniature golf. After a fantastic visit at Patti's Settlement enjoy a peaceful night sleep and wake-up to a warm breakfast and hot coffee. Our staff look forward to making your stay as relaxing and comfortable as possible. Visit www.kentuckylakebarkley.org to see all the upcoming events and a list of the areas 27 golf courses that our historic town has to offer.